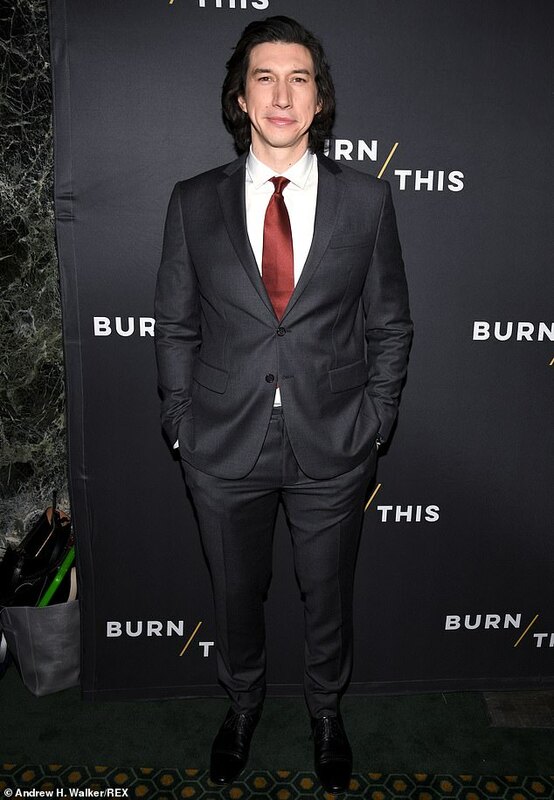 Adam Driver and Keri Russell were all smiles as they debuted their new revival of Burn This on Broadway, but Russell got teary-eyed when it was all said and done. Driver, 35, and Russell, 43, were seen on stage, holding bouquets of flowers after their revival of Lanford Wilson's 1987 play, as Russell started getting emotional during the curtain call. The Americans star was seen wiping tears from her eyes as she stood on the stage with her cast mates Driver, plus David Furr and Brandon Uranowitz. On stage, Russell was wearing a teal dress and black heels, but on the red carpet, she rocked quite a different look. On the red carpet, she was wearing a full tuxedo with a white shirt, black pants and bowtie, but no tuxedo jacket. She also posed on the red carpet with the rest of her cast mates, along with director Michael Mayer. On stage, Driver was clad in black, with a black button down shirt tucked into black jeans with a black leather jacket and black cowboy boots. On the red carpet, Driver was clad in a sharp grey suit with a white dress shirt, maroon tie and black shoes.